Truck rolls off wooden bridge in Lower Pottsgrove, Pa.
LOWER POTTSGROVE, Pa. (WPVI) -- First responders were on the scene of a crash involving a large truck on a small wooden bridge in Lower Pottsgrove, Pa. It happened before 10:30 a.m. Monday on what appeared to be an access road or driveway off Sunnybrook Road. 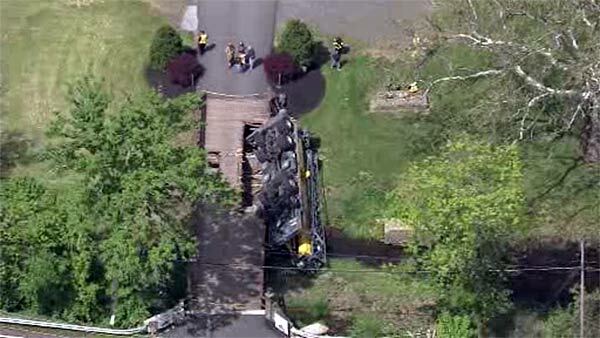 Watch Chooper 6 raw video at the scene of an accident where a truck tipped over on a small bridge on Sunnybrook Road in Lower Pottsgrove. Video from Chopper 6 HD showed a large truck which rolled off the side of a wooden bridge after half of the bridge's wooden driving surface gave way. The truck was lying nearly upside down in a shallow ravine. Action News is told no serious injuries were reported.